It’s not often that you think you just did something nobody’s ever done before. But today, it might have happened. It’s Purim, so I’m making the hamantaschen recipe my grandmother z”l developed while she was alive, and passed down to me. It’s my family obligation to make this recipe now every year and send hamantaschen out in boxes (gifts called mishloach manot) to my family and dear ones. I’ve done my best to preserve this recipe; I’ve written it up in the New York Times, I’ve taught workshops on how to make it for two Purims in a row, and I’ve committed to the family hamantaschen-baking role. Very carefully, I have made the possibly-world’s-first Sierpinskitaschen. It’s a little… irregular, but charmingly so. And it smells better than any Sierpinski triangle I’ve ever met. Now, just to be clear, I am not a mathemataschen, not by any stretch of the imagination. But I’ve been more and more inspired by math lately (details in a moment). I learned some basic facts about the Sierpinski triangle as i went. First of all, when rotated to any side, it looks the same; I couldn’t even tell where I’d started it. Also, as the triangles get smaller, notice a pattern in the quantity of each size: 1, 3, 9, 27…. I’m sure it would go on if I could make really really tiny hamantaschen, but I don’t have that much power. Also, technically this triangle has no area, so maybe all the sugar doesn’t count? But careful with that logic: it has infinite perimeter, and that dough for the perimeter is full of not-healthy ingredients like flour and sugar and oil. You too can make this! Start with my grandmother’s recipe. FYI, it’s not gluten-free (or paleo-friendly). Tomorrow I’m going to try a rice flour/tapioca version for myself, since I’ve been good and not eaten a single one of the hamantaschen I’m baking. Also, this is not a healthful recipe. It includes flour, sugar and oil, the trifecta I almost never eat. For the oil, I settle for high-oleic sunflower oil, since the high-oleic sutff is lower in omega-6 fatty acids. Get yourself a dough scraper, about 5″ wide. You could do this with a knife too, but a dough scraper is a great tool to have around the kitchen for cleaning cutting boards, lifting fragile cookies, assembling hamantaschen, etc etc. 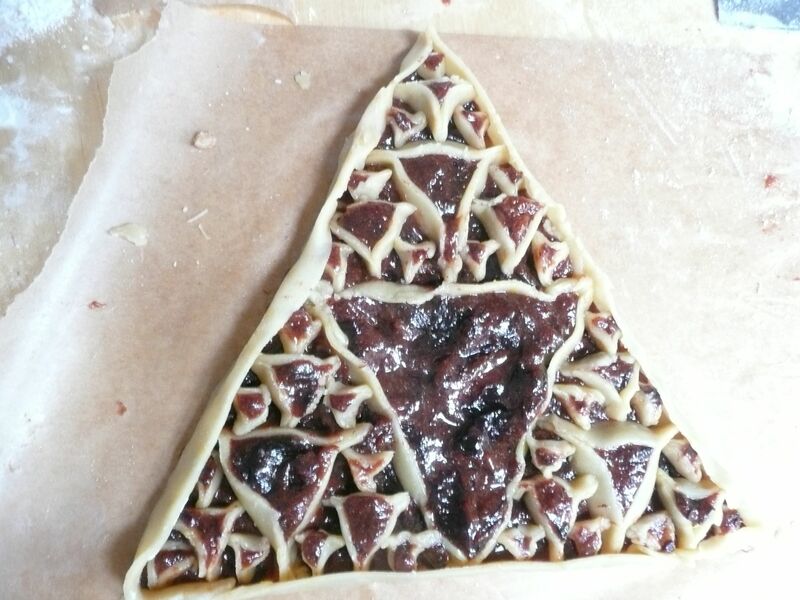 Roll out the dough and cut an equilateral triangle about 10″ on each side. Draw a line down the middle each way. Measure this carefully. 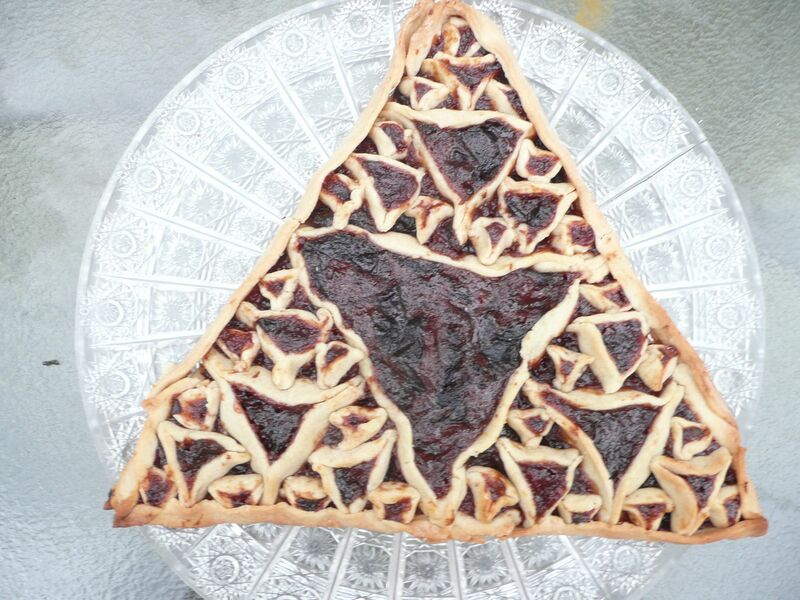 From strips of cut dough, make a triangle in the center, from the middle point of each triangle’s side. These dough strips will not want to stand up. So, use bits of aluminum foil to hold them in place. Quickly fill the center with prune butter. Next, you’re making the three second-largest triangles. Take a glass about 3″ wide — to get the right measurement, hold it in the place where the next three large triangles will be and see if it fits perfectly. Follow grandma’s instructions for making those into hamantaschen. Place them, with one flat side up rather than one pointed side up (just like your big triangle). Now, fill all open spaces with a thin layer of prune. Now, find your next-smallest circle size, probably a little smaller than a shot glass. I used the top of a spice container. 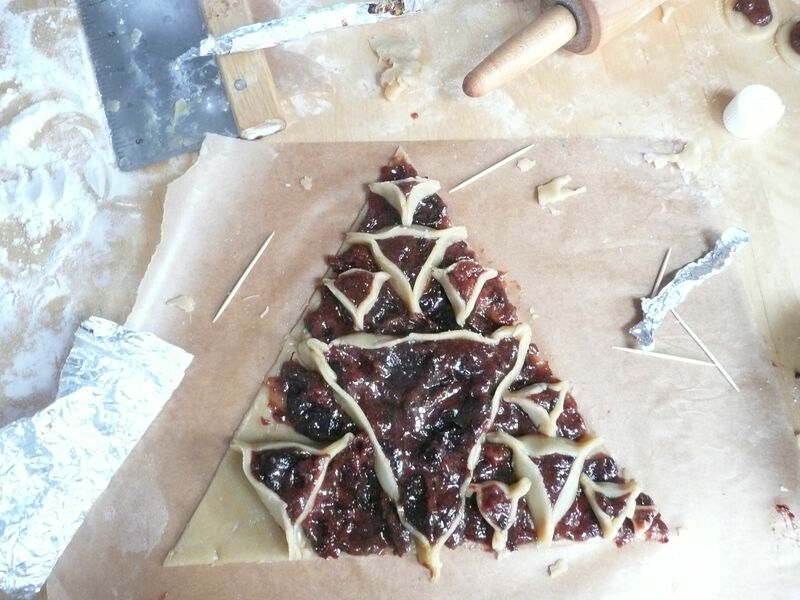 Make those into nine tiny hamantaschen, and place them into the fitting holes (consult a picture of the Sierpinski triangle as you do this). Finally, fill in the last spaces with 27 very tiny hamantaschen — I used the top of a bottle of vanilla extract. Finally, time to make the sides. 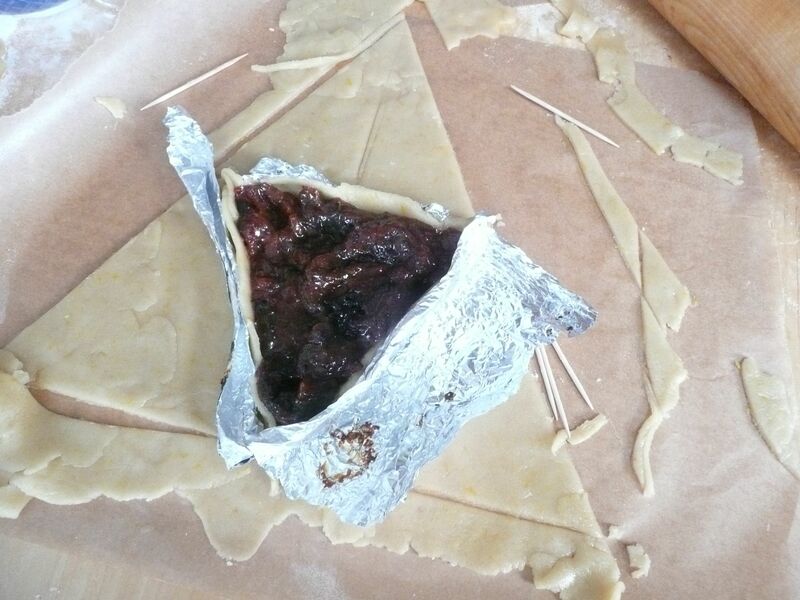 Roll out strips of dough and drape them around the sides and corners of the hamantaschen, letting them lean in a little. Bake at 375 till golden brown at the edges. And share, infinitely. Especially, but not exclusively, with Jewish math geeks. pretty amazing hamantaschen you got there! next time you make one, maybe you’ll consider using one of my family recipes. Mazel tov! Possibly the most creative thing I’ve seen done with food for the sake of sheer whimsy. I wonder if Randall Munro from XKCD has gotten wind of this? Not only that, they look delicious! A recommendation for next year’s gluten free recipe: garbanzo bean flour. I used it last year, with the addition of some rice flour and it was well recieved even from the gluten eaters. Wow, very cool! Your Sierpinskitaschen look so delicate and delicious, it must have taken so much skill and patience to make them! This is one of the coolest things I have ever seen! 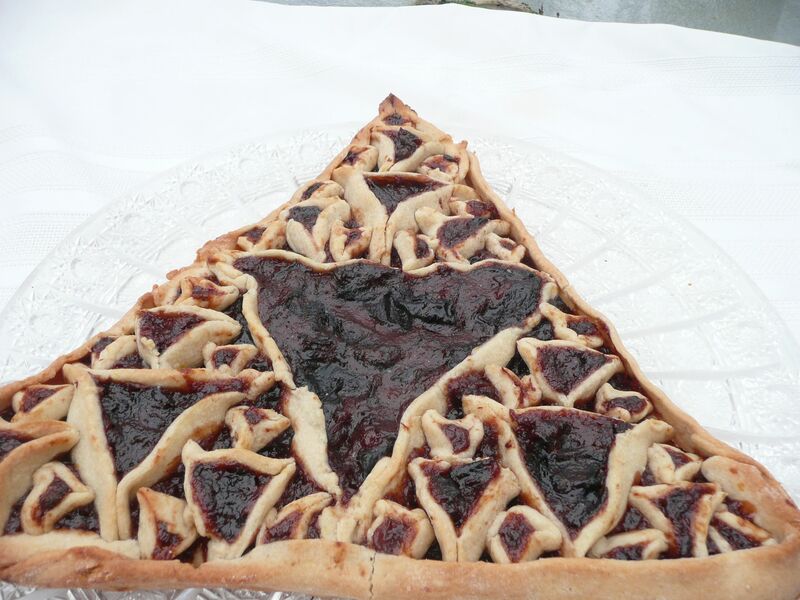 I do a ton of different food creations for both math groups (where they coordinate with the theme of the meeting) and Jewish occasions – but the Sierpinskitaschen tops them all. I don’t know if I’d have the patience to make it, but I might show a picture of yours at a Latke-Hamemtaschen debate. Coincidentally, I just met Dan & Katherine at a math circle conference over Purim weekend. Thanks for sharing this. I am so glad I found this. I was looking for validation re: using my mother-in-law’s mandelbrot basic dough for hamentash, and wasn’t finding it. And here it is – the exact recipe PLUS math. Thanks! Fractals used to be one of my favorite topics when I taught Pre Calculus. 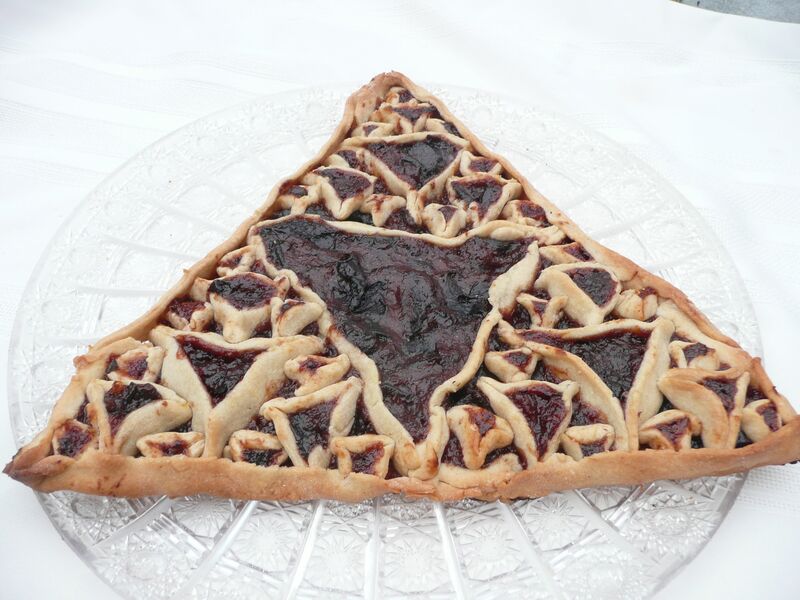 The sierpinski hamantaschen are a delicious reminder! 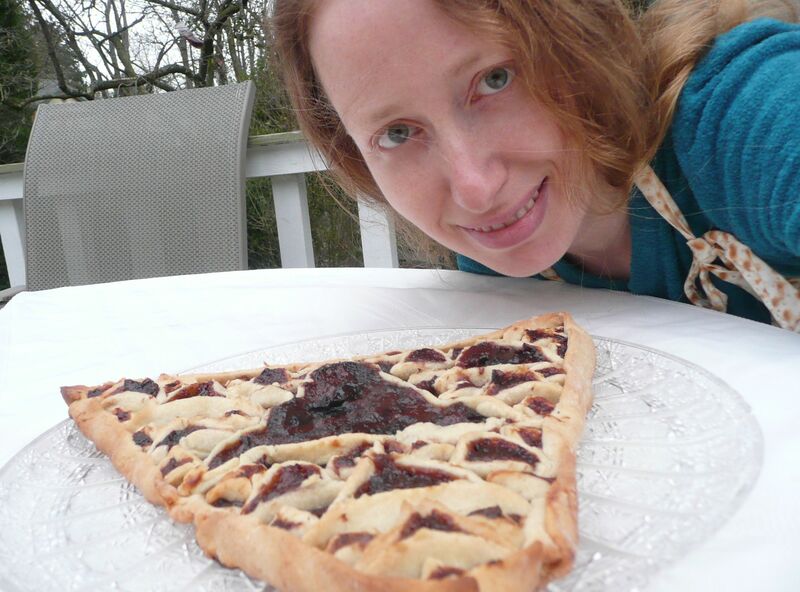 Very intersting and tasty application of fractal figures. But what puzzles me the more is not your culinary imagination, but your incredible resemblance with my daughter. And far more, she is a (French) mathematician, and especially fond of geometry. You should get acquainted with each other! Really! Apparently I have some doppelgangers out there. Sure, put us in touch! I’m actually technically in a part of France right now (hence no new posts), in French Guiana in South America. Hello! I am the daughter and your doppelganger! You can contact me at cerise26@voila.fr if you want! What’s next? Sierpanikopita? Pascal’s Popovers? Tortellini tori? Or perhaps a course in culinear algebra? Culinear algebra = excellent! I was thinking maybe Fibonacci’s cake. Which, of course, would be created from a cheese cake. Sorry, I just saw this. I had to change my comments settings so that I approve comments because WordPress was doing a pretty bad job of filtering out spam. This is your post, yes? http://blogs.forward.com/the-jew-and-the-carrot/215952/hamantaschen-plus-math-equals-mathmataschen/ If so, it’s fine, and thanks for the link back. Happy Purim!